The Global Volcanism Program has no activity reports for Davidof. The Global Volcanism Program has no Weekly Reports available for Davidof. The Global Volcanism Program has no Bulletin Reports available for Davidof. Five small islands, the largest of which is Davidof, are remnants of a stratovolcano that collapsed during the late Tertiary, forming a 2.7-km-wide caldera. 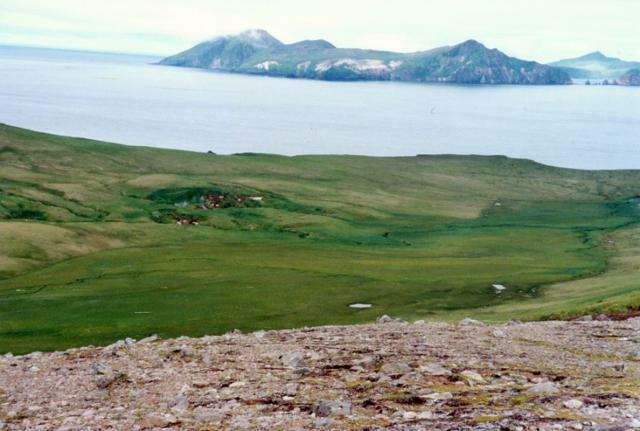 The islands, the highest of which reaches only 328 m above sea level, include Khvostof, Pyramid, Lopy, and Davidof. The latter three islands form the eastern rim of the mostly submarine caldera, sometimes referred to as the "Aleutian Krakatau." The islands were constructed above a roughly 100-m-deep submarine platform extending NW-ward to Segula Island; the floor of the caldera lies 80 m below sea level. The islands are vegetated, but lava flows are recognizable, and Smith et al. (1978) suggested a possible Holocene age for the volcano. Nelson W H, 1959. Geology of Segula, Davidof, and Khvostof Islands, Alaska. U S Geol Surv Bull, 1028-K: 257-266. The Global Volcanism Program is not aware of any Holocene eruptions from Davidof. If this volcano has had large eruptions (VEI >= 4) prior to 10,000 years ago, information might be found on the Davidof page in the LaMEVE (Large Magnitude Explosive Volcanic Eruptions) database, a part of the Volcano Global Risk Identification and Analysis Project (VOGRIPA). There is no Deformation History data available for Davidof. There is no Emissions History data available for Davidof. 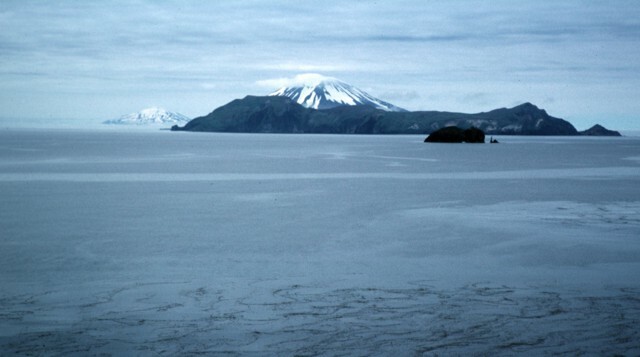 The view WNW from the western side of Little Sitkin Island includes the broad snow-free island of Davidof, part of the rim of a largely submerged caldera, across the right center. The snow-capped peak behind Davidof is historically active Segula volcano. In the background at far left is the snow-capped Kiska volcano. Photo by Steve Ebbert, 2000 (U.S. Fish and Wildlife Service). Davidof Island rises across a strait from the western side of Little Sitkin Island. Five small islands, the largest of which is Davidof, are remnants of a stratovolcano that collapsed during the late Tertiary, forming a 2.7-km-wide caldera. The islands include Khvostof (upper right horizon), Pyramid, Lopy, and Davidof. The latter three islands form the eastern rim of the largely flooded caldera. The islands are vegetated, but lava flows are recognizable, and Holocene activity may have occurred. There are no samples for Davidof in the Smithsonian's NMNH Department of Mineral Sciences Rock and Ore collection. Large Eruptions of Davidof Information about large Quaternary eruptions (VEI >= 4) is cataloged in the Large Magnitude Explosive Volcanic Eruptions (LaMEVE) database of the Volcano Global Risk Identification and Analysis Project (VOGRIPA).